On this website you can find information about the research of Sebastian Koenig, Ph.D., Experimental Psychologist and Human Interface Technology Engineer. After completing my Ph.D. in Human Interface Technology at the HIT Lab New Zealand, I have completed my postdoctoral studies at the USC Institute for Creative Technologies, Los Angeles, CA and at Red 5 Studios, Laguna Hills, CA. I am now running my own company, Katana Simulations, to develop clinical and educational software. More examples of my work can be seen under Research. I was just recently awarded the ISVR Early Career Investigator Award (2nd place) by the International Society for Virtual Rehabilitation. 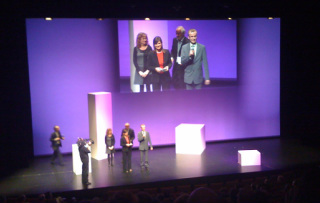 My thesis work has been awarded the Laval Virtual Award, category Medicine & Health, during the 2011 Laval Virtual conference, France.